Through the years, I have had a small list of questions to which I have been searching for answers. 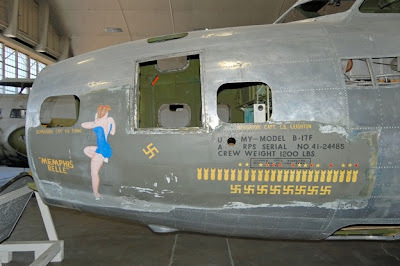 These include: liberals – why, the mind – does it really disappear inside of airport terminals, and why does the hot babe painted on the side of the Memphis Belle wear blue on the left side of the plane and red on the right? After many years of asking everyone I could find, I finally posted it on Facebook and got this qualified answer from "someone" who is working on the restoration of the “Belle” herself. The blue may not make sense but I’ll explain that later. Here is his answer. "The story behind the Belle is.....The airplane was named after the pilots girlfriend (which he did not marry) who lived in Memphis. She was a swimsuit model who was in Esquire magazine.....we actually have a copy of the magazine she was in at the museum. The reason for the different colored suits is that they wanted her to match the nav lights of the time...but when the artist was told to put the red on the left side and vice versa he took the right and left from looking at the airplane front to back...not the pilots view so they were backwards and they just left it that way....that’s the story they (crew members) told us." So what about the green? 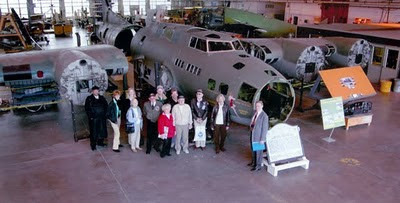 Students of vintage aircraft know that the methods used to color glass green during WWII left manufacturers with lenses that could better be described as blue with a green tint, especially in daylight and not when lit from the light itself. Thus the painter most likely looked at the lenses and painted away with the colors he thought best matched. And there you have your answer. If you want to learn a little more, maybe you'll like this link.